"I ordered six coffee cakes and all were received on time. My Grandma's coffee cakes are delicious!!! As usual." The perfect Coffee-Time companion, this sour cream based, cappuccino coffee cake combines the perfect blend of rich Italian Espresso with our original cinnamon walnut streusel. Serve it plain or with your favorite ice cream. The one-pound twelve-ounce coffee cake by My Grandmas of New England serves approximately 10 - 12 and can be frozen up to four months. Kosher Certified and contain no trans fats, artificial flavoring, artificial coloring or preservatives! A classic Japanese design with a removable infuser and lid, the Bee House Round Ceramic Teapot brews 15 ounces of tea for one or two people and is perfect for making tea at home or at the office. Savor the pleasures of a simple cup of tea. Made in Japan, Certified Lead and Cadmium Free. This is a cake lovers dream! 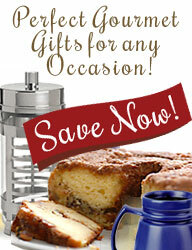 Excellent value - any three Signature Coffee Cakes for one low price! Select any three CoffeeCakes.com Signature Coffee Cakes. Selections for the CoffeeCakes.com Sampler include Traditional Cinnamon Walnut Coffee Cake, Apple Walnut Coffee Cake,Blueberry Coffee Cake, Chocolate Walnut Coffee Cake, Lower Fat Cinnamon Walnut Coffee Cake and No Walnut Cinnamon Coffee Cake. Cakes stay fresh on the counter for a week or can be frozen up to four months. These cakes are trans fat free and do not contain any artificial coloring, artificial flavoring or preservatives and make great gifts for giving and entertaining. ** Due to fluctuations in our inventory we reserve the right to substitute an alternate cake in your sampler if necessary. If, after taking your order, a particular cake becomes unavailable, we will substitute it with one of our other gourmet cakes of equal or greater value.